The Moscow Central Election Committee has just announced the deadline for the nomination of Moscow mayoral candidates. Meanwhile, a few opposition leaders and liberal politicians, including Mikhail Prokhorov, find themselves unable to run for office. The Moscow City Elections Committee told Interfax on Thursday that the term for submission of candidates' nomination in the mayoral elections to be held in Moscow on September 8, which began on June 11, will end on July 10. "In line with a calendar plan endorsed on June 10, the deadline for submitting documents to nominate the candidates is 6:00 p.m. July 10," a committee spokesperson said. The Justice Ministry department for Moscow will publish a list of political parties and their regional branches in Moscow entitled to nominate candidates for the mayoral elections not later than June 14. The list will then be forwarded to the Moscow City Elections Committee. Some opposition leaders and liberal-minded politicians initially planned to participate in the upcoming mayoral elections. But some specific circumstances prevent them from being nominated. 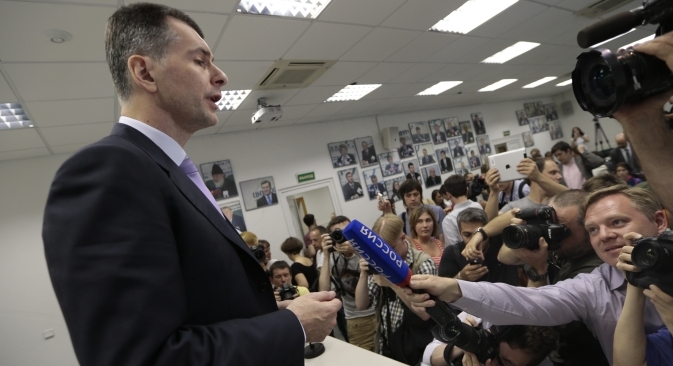 Civil Platform leader Mikhail Prokhorov refused to participate in the Moscow mayor elections. He said that the measures taken by the Russian authorities and objective circumstances stood in the way of his plans to run in the Moscow mayoral election. "I personally would like to take part in the elections of Moscow's mayor very much," he said. "I feel the support of Muscovites - they voted for me during the Russian presidential elections. But objective circumstances and tricks on the part of the authorities do not let me do so." "It is a position of strength, not weakness," Prokhorov said, adding that his decision not to run for the post of Moscow mayor did not mean that he was scared of anyone. "If you analyze what I have done over the past 20 years, you will hardly be able to accuse me of being a coward. I have always chosen to face the difficulties. Moreover, I think I am an expert as far as difficulties are concerned. The bigger the challenge, the more it motivates me." According to Russia's current laws, Prokhorov can't run as a candidate for Moscow's mayor because he has to re-register his foreign assets to participate in the mayoral elections. According to him, it is impossible to re-register any assets "effectively, honestly and transparently" within such a short period of time. "It is a trick. It is legal but it is dishonest. These obvious things are aimed at stopping Prokhorov. This is the price of these elections. The Muscovites themselves will have to decide what is right and what is wrong," he said. Prokhorov said he was not boycotting the elections, and that he will rather focus on the battle for seats within the Moscow city legislature. "It is my own choice. I will meet with my supporters and will discuss it openly. We are going ahead in accordance with our plans and are not playing by the rules imposed on us by others," Prokhorov said. Meanwhile, the Communist Party believes the refusal by Prokhorov to run for the post of Moscow mayor indicates his weakness as a politician. "It is obvious that Civil Platform's political plans have been shattered. Prokhorov hoped to increase his status as a politician. However, he has problems with finances and with passing through the municipal filter," the head of the Communist Party faction in the Moscow City Duma Andrei Klychkov told Interfax on Thursday. He added that Moscow deputies would not support Prokhorov. "It would be the end of his political career. It would indicate his weakness in politics," he said. Russian opposition leader and anti-corruption campaigner Alexei Navalny also planned to participate in the mayoral elections, but the criminal charges against him hamper his chances to run as a candidate for the mayoral post. At the same time, on June 4 Yabloko liberal party leader Sergei Mitrokhin announced that he might stand for the post of Moscow mayor. In early June Moscow Mayor Sergei Sobyanin announced his resignation, a decision aimed at enabling him to run in the city's mayoral elections in September. Meanwhile, some 47 percent of Muscovites are ready to vote for Sergei Sobyanin in the hypothetical mayoral election next Sunday, according to Levada Center. The acting mayor's rating stood at 36 percent a year ago, it said. A city poll of 506 respondents older than 18 was held on June 7-10. Twenty-one percent of the respondents said they preferred an opposition candidate (31 percent a year ago), and 33 percent were hesitant. Forty-five percent chose Sobyanin while answering the direct question "which of the following candidates you would support in the Moscow mayoral election on Sept. 8". Civil Platform leader Mikhail Prokhorov ranked second with 12 percent, and founder of the RosPil anti-corruption fund, blogger Alexei Navalny came third with 3 percent. Other possible aspirants for the mayoral position - Sergei Mitrokhin (Yabloko), Sergei "Spider" Troitsky (Corrosia Metalla rock band leader), Oleg Mitvol (the Green Alliance - the People's Party) and Sergei Udaltsov (Left Front) - gained 1 percent or less. Forty-five percent of the respondents said they would cast their votes in the Sept. 8 election, 18 percent would not vote, and 37 percent either said they would make a decision later or could not answer the question.